The basic unit of Honey Bee existence is the colony and not the individual. 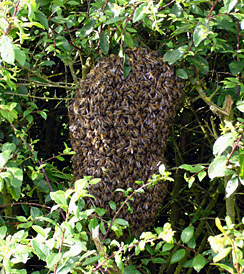 Honey Bees swarm to multiply the number of colonies and thus propagate and perpetuate the species. As the colony increases in size and space is reduced it makes preparations to divide (swarm). A number of young queens are raised in special cells and the old queen is partially starved to slim her down sufficiently to be able to fly. When the new queens are ready to emerge the old queen will fly off with the older flying worker bees as a swarm, leaving behind the younger bees and a newly emerged queen. The workers in the swarm will have filled with honey before leaving and be quite docile and not inclined to sting when the swarm has recently left the hive. The bees that swarm with the old queen do not go far from the hive. Maybe because queen bees do not fly as well or as fast as workers! They will move on from each resting spot until a new home is found (or until a beekeeper collects them and puts them into a new hive.) Swarms can survive for a number of days on the honey stores they filled themselves with before leaving the hive. As the days pass they will be more upset when approached - hence it is important to get a beekeeper to collect them quickly.